There comes a point in any cooks career where he or she can proudly exclaim, “this is the best thing that I’ve ever cooked.” To the fortunate few this revelation may come often, to others it may only happen once, but for me, it happened tonight. The idea of combining the flavors of pork, apples, and collard greens has been floating around in my head for awhile now. In retrospect, I’m sure the foundation was laid the first time I was introduced to the combination of braised pork belly and roasted apples at Joël in Atlanta. And the time I had a pork chop and collard greens at Hot and Hot Fish Club in Birmingham. But it was in the ephemeral moments of a sleepless night about a month ago that I found the inspiration to combine the two. “What if,” I said to myself, “I braised collard greens in hard and sweet apple cider, threw in a sliced onion, a few whole garlic cloves, a pinch of red pepper flakes, topped it with grilled pork tenderloin and spooned on the delectable pot liquor.” Realizing the importance of this idea, I quickly awoke from my dreamy, timeless state and took pen to paper in my handy little green book of ideas. As it turns out the combination is stellar– obsession worthy, even. In an atmosphere abound with dim lights, comfy seats, and someone to pour your water it would easily pull $30 out of your bank account. In truth, money and time permitting, this dish deserves the best. 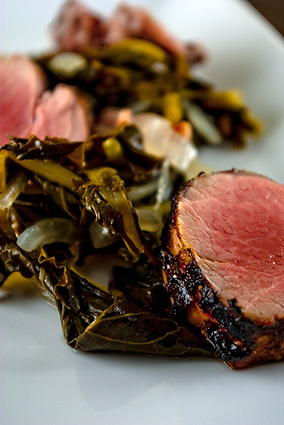 Fudge Farms pork tenderloin, Tellicherry black peppercorns, Maldon sea salt, organic collard greens, garlic, and onions from a local farm, fresh pressed apple juice, Original Sin hard cider, Nueske’s apple wood smoked bacon, real hardwood charcoal and a chunk of apple wood to top it off. Trust me, you won’t regret it. In a large dutch oven, reduce sweet cider by half. Add in the two bottles of hard cider and bring to a boil. Add in the onions, garlic cloves, chili flakes, bacon and collard greens stirring until the greens are wilted. Season with a pinch of salt and and a few turns of black pepper. Cover and gently simmer, stirring occasionally, until the greens are tender but retain some texture, about 45 minutes to 1 hour. Note: The greens be made ahead, refrigerated for 1-3 days before using, and reheated before serving. Pat the meat completely dry with a paper towel. Season meat equally on all sides with salt and fresh cracked pepper. Roll gently in oil to prevent sticking on the grill. Lightly oil grill grates with a paper towel and place the chunk of apple wood in the flame. Once the wood is smoking and the grates are hot, add the tenderloin and grill over medium-high heat, covered, until the pork is medium-rare to medium (approximately 140º to 150ºF). Warm plates in a 200º oven, if desired. 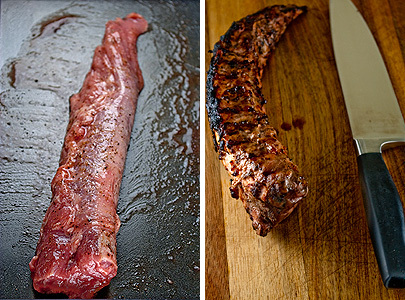 Slice pork into 1″ rounds. 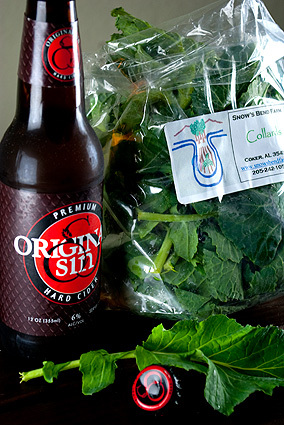 Drain collard greens, reserving the pot liquor. 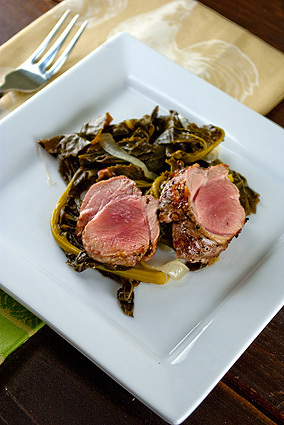 Spoon a layer of collard greens onto a plate, top with pork tenderloin, and spoon pot liquor over. Serve immediately. I think you should recreate for your family Saturday night! It really does look scrumptious! This is making me insanely hungry! The photos are beautiful! .-= Crepes of Wrath´s last blog ..Magnolia Bakery Banana Pudding =-. Identified you web site through yahoo I have to admit I m fascinated with the content! 8 years ago my husband had a dish like this at a restaurant in Baltimore that has since closed down. 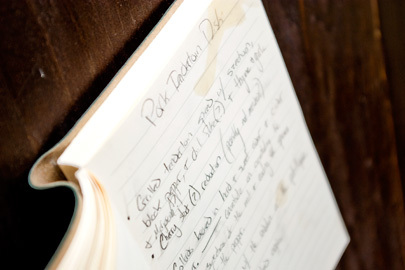 He has been asking me to make “that pork and greens dish” ever since – this looks right on. I cannot wait to try it!! So one question before I dive it- is the bacon cooked ahead of time or does it cook in the liquid? Hi Meg, at the time the bacon was cooked in the collards. Now, I’d prefer to prepare the bacon last for a smokey, sweet, and fatty contrast to the pork and collards. more well-appreciated than you may be right now. it’s something to do with Girl gaga! Your personal stuffs outstanding. I am not certain the spot that you are taking your info, however excellent issue tips. I actually has to take some time learning far more as well as exercising far more. Appreciate your wonderful data I’m in search of these details for my assignment.